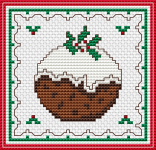 Cross stitch design of a chocolate pudding that celebrates the art of baking. The proof of the pudding is in the eating. 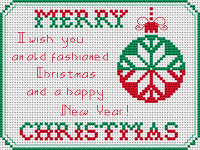 I wish you an old fashioned Christmas and a happy New Year! 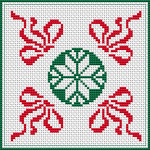 Christmas-themed biscornu in red and green colors on white fabric. If Christmas Day on a Monday be, A great winter that year you will see. 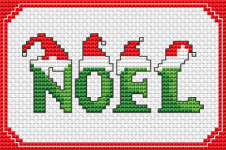 Simple cross stitch pattern of the word "Noel" or “Christmas season”. Funny little snowman in the snow wishing you Happy Holidays! Happy little snowman under the snow on sky blue Aida. 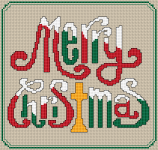 Christmas greeting pattern in red, green and white. 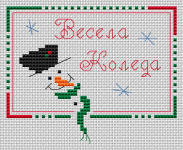 Cross stitch pattern of a Christmas ornament with ribbon.